On Thursday I was in work and ploughing through my work and enjoying some background noise of a batch of podcasts I had recently downloaded. One of these was Warp-drive active, which started with a rather fun “Boys are back in town” which made me chuckle. 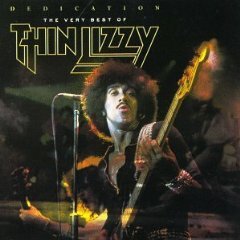 So during a late night game of Ryzom (that had just downloaded, more soon) I finally gave in and stuck on Dedication : The very best of Thin Lizzy, which suited the game rather well. Sunday night Mr. Dok came around and with Guitar Hero: Greatest Hits and GH: Metallica both of which totally rocked. We rocked out to a awesome selection of different tunes, damn hard at times tho. Of course we finished the evening with a The boys are back in town again. Continuing this list of linked occurrences I put the radio on while having a bath and happened upon Jeff Wayne’s War of the Worlds on radio 2. It wasn’t the original but a recently recorded version, but when I turned it on just happened to be at the section “Parson Nathaniel”, which in the original recording was performed by Phil Lynott. I thought at the time, I should really get a re-mastered version of the musical. So I was well please when I tuned in to the Through the Aftermath podcast and heard a rather fantastic version of the War of the Worlds radio broadcast as performed by Jonathan.